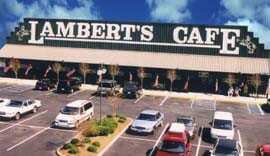 Sikeston, Missouri is the location of LAMBERT’S CAFE I and of the original cafe which opened in March 1942. The cafe standing right now is the fourth one to be located in Sikeston. 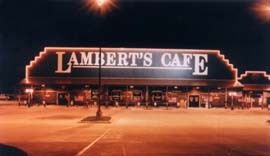 Each move from the original LAMBERT’S came as popularity of the cafe increased and more space was needed. 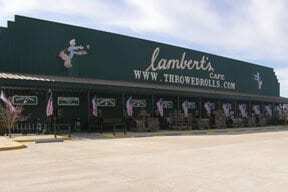 In 1976, Norman Lambert, son of the founders and original owners, Earl and Agnes Lambert, threw the first roll. At the original location, he would walk around and hand out the rolls. One day it was really busy and when Norman couldn’t get through the crowd, one of the customers yelled to him ” Throw the D*** thing!”. 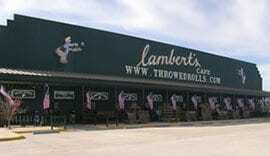 And with that the only HOME OF THROWED ROLLS was born. You can drag this map with your mouse, or double-click to center. The red icon represents the location of Lambert’s Cafe. You can click on that icon to obtain driving directions. 10:30 a.m. to 9:00 p.m. or so. Range from $9.99 to $22.99.